Embroidery from the Saurashtra and Kutch regions in Gujarat is not only famous but also versatile. There are plenty of stitches used to beautify the product. Abhala is the embroidery where small round pieces of mirrors are fixed on to the fabric using buttonhole stitching";" the embroidery is done in a herringbone stitch using silken thread. Rust, light green, indigo, blue, deep red, pink, and purple are the colours used. skirts, kurtis(ladies shirt) and richly embroidered blouses are the other famous items by the craftsperson?s. Kathi is the oldest embroidery which is known for its romantic motifs. Geometrical motifs are fabricated with multicolored fabric pieces leading to patch work effect. Varieties of items are prepared. Heer is an embossed stitch having shades of off-white, yellow, madder red, black, indigo, ivory, and green. Small mirror pieces are used to add more beauty to the embroidery. Ari embroidery with silk threads using a hook is a popular craft of Kutch. The motifs found commonly are, dancing peacocks, human figures in dancing poses. A Bandhani pattern complimented with beautiful and delicate bead work is an art to be praised. The various communities in Gujarat --- rabaris , , ahirs, , jats, bharwads bharwads and harijans have their own styles of embroidery. Cotton and quality silks are used by jats and mutuwas to decorate women's outfits. 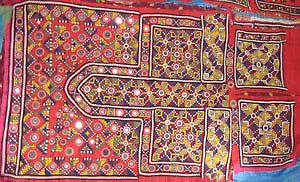 The embroidery of the Rabari community is usually done on a maroon background with the enclosed motifs.